Bollards are a sturdy guide that helps protect pedestrians and motorist alike, also ideal for providing a safe perimeter—buffering any brute access attempts. While these unique inverted cone bollards are a formidable security upgrade, available in a variety of color options, they also enhance curb appeal. Top 18"Dia. x Bottom 11-3/8"Dia. 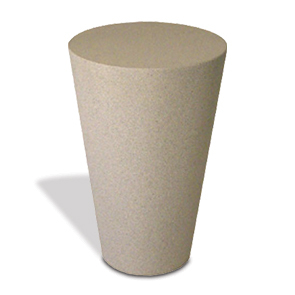 These concrete bollards meets ASTM standards, with durable reinforced concrete they are highly resilient in high volume environments and in just about any weather conditions.